Further decomposition of DP-111 is based on the necessary steps to attain high quality manufacturing processes via statistical process control methods, process design and optimization (robust design), as shown in Figure 2. Thus, FR-111 and DP-111 together state that manufacturing contributes to a high quality product not just by simply being within the tolerance specifications but by having a process centered on the designer’s target value with minimal variation. The first requirement of manufacturing processes with minimal variation from the target is Process Stability (FR-Q1). A process is said to be in a state of control when there are no assignable causes of variation present and instead only common causes. Assignable causes are non-random events, that when eliminated or corrected result in the process returning to a state of control (i.e. process is once again stable). Examples include tool wear and failure, improperly adjusted devices (torque guns, spindle speed), chips caught under fixtures, plugged coolant lines, etc. Therefore, the design parameter that achieves process stability is the elimination of assignable causes of variation, DP-Q1. This DP corresponds to the first major step in statistical process control techniques used to quickly detect the occurrence of assignable causes at the machine. Quick detection allows investigation of the process and permits corrective action to be taken before many non-conforming units are manufactured. However, a stable process alone is not a sufficient condition for high quality manufacturing processes. For example, a process may be unstable, yet produces parts that are within the specification limit. The next two functional requirements provide the necessary conditions for high quality given a stable process. A process that is stable and has a sufficiently small standard deviation may still be producing an excessive number of out-of-tolerance parts. Figure 1 shows a process distribution with a mean that is too close to the upper specification limit and thus is producing defective parts despite an acceptable standard deviation. FR-Q2 gives the requirement to deal with ill-centered process means. 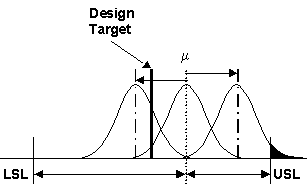 To correctly place the process mean at the required design target involves adjusting process parameters DP-Q2. Manufacturing system engineers have only freedom to control m and s of the process (through operational process adjustment) since the specification limits LSL and USL are dictated by product design. The third high-level quality requirement is to reduce variation in process output – FR-Q3. Variation that is seen in the output of a stable process is the result of the existence of uncontrollable noise factors in the process. Noise factors as defined by Phadke (1989) are the parameters that cannot be controlled by the designer and lead to the variation causing quality loss. To reduce variation in process output requires the reduction of process noise, DP-Q3. Further decomposition of DP-Q3 leads to the requirements to reduce noise factors in process inputs and sensitivity to noise in the output. The dependencies as shown in Figure 2 state that a stable process (FR-Q1) is first required, followed by centering the mean (FR-Q2), followed by reducing variation in process output (FR-Q3). The complete decomposition of the quality branch is shown in Figure 2. 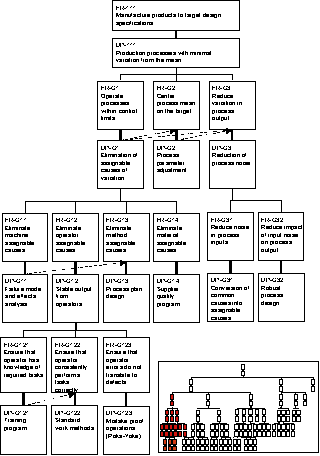 Figure 2: DP111 is based on the necessary steps to attain high quality manufacturing processes via statistical process control methods, process design and optimization (robust design).